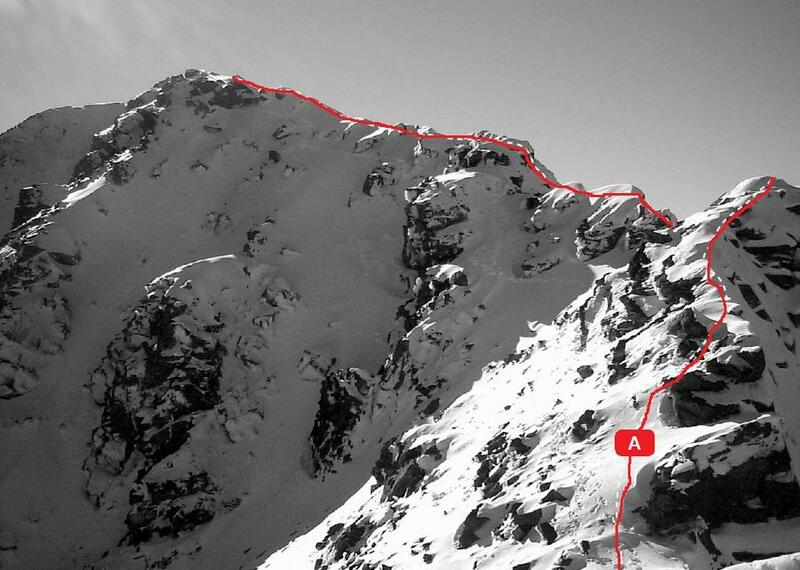 If you are short of time or the weather is bad westwards, then no contest – Pinnacle is the best climb in this guide. You can usually take your 4WD vehicle right to the hut, and the rock is interesting and enjoyable. From Leatham Station follow a rough and narrow 4WD track on the true left of Boulder Stream to Boulder Forks Hut (6 bunks, standard). Just past the hut, go up McCallum Stream to just before a small gorge. 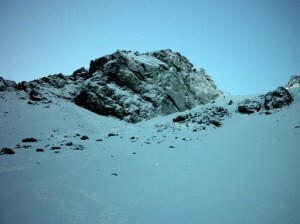 From here, climb through forest onto the spur to the north and along to a saddle where the rocky summit pyramid begins. Alternatively, a more direct route is to climb steep loose scree out of McCallum Stream onto the open spur to the south. Where this merges into the north-west face, climb a gully (or good rock right of the gully) to just north of the summit. From Boulder Forks Hut, walk up the streambed and into Kroshen Stream. Bypass a waterfall on the true right. There is a good campsite on a tussock shelf at 1100m, with a great view of steep slabs on the south face of the summit pyramid (probably unclimbed, and could be a project for keen alpine rock jocks). Climb scree on the south-west face and up a short rocky gut to the ridge. Turn a rock step on the western side, via a narrow exposed ledge (difficult if snow covered) or else an awkward chimney. A variation to SW Ridge. From the campsite in Krushen Stream, climb scree on the south-west face to a small col on the south ridge. Follow an obvious rocky corner below the huge slabs, and then a short steepish scramble on good rock to the summit. The easiest route, with little rockfall danger and little scrub bashing, onto the spur on the true left of McCallum Stream, is to climb an open tussock and scrub slope on the true right of the next major creek to the south (locally known as Waterfall Creek, for obvious reasons). Pitch one - up flaring rightward tending crack the straighten up into v shaped gully. Pitch two - continue up gully on fairly broken rock. Protection minimal but easy climbing.